Along with driving the Golden Circle and visiting the Blue Lagoon, seeing puffins in the wild was something that our family was dying to experience during a 5 day stopover in Iceland. Iceland has one of the largest populations of Atlantic Puffins in the world, with millions of breeding pairs visiting each year during the summer months. 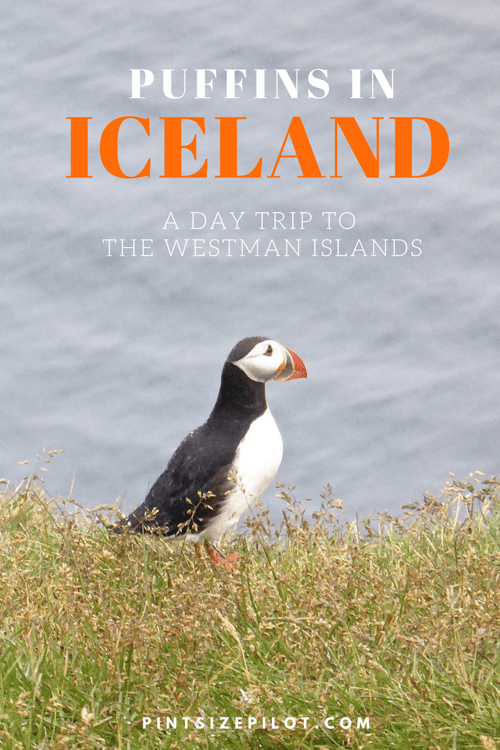 Although it is possible to take a boat tour to a puffin colony right from Reykjavik, we chose to instead to take a day trip to The Westman Islands (Vestmannaeyjar), the breeding grounds for roughly 50% of all of Iceland’s puffins. It wasn’t just about the puffins though. 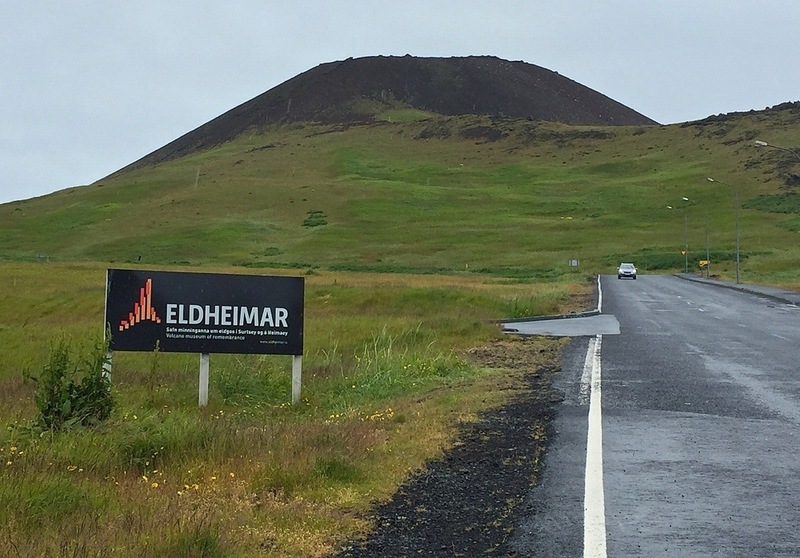 Heimaey, the only inhabited island out of a group of 15, is also home to two volcanos, something that I knew would be of great interest to my school-aged children. Throw in some stunning scenery, and what you have is a pretty fantastic Iceland day trip itinerary. With coffees and pastries in hand (from the gorgeous Sandholt bakery and cafe in Reykjavik), we set out in our rental car early in the morning for our two hour drive to the ferry. While the scenery en route was not as dramatic as what we had enjoyed on the Golden Circle, there were still some lovely things to see along the way, including a beautiful waterfall in the distance, and a half dozen Icelandic horses racing alongside our car. Although we had pre-booked our ferry to Heimaey online, we still experienced some momentary confusion at the dock. The online ticket needed to be redeemed for another ticket and then the whole family (except for my husband who was driving the car) had to exit the vehicle and board the ferry with the walk-on travelers. No matter how well we try to plan things on our trips, there is still the occasional moment of confusion like this — something that we have come to welcome as part of the adventure. One of the most popular spots for viewing puffins on Heimay is at the Storhofdi Puffin Lookout, which is just a 10 minute drive from town. What we enjoyed more, however, was driving a little further up the road and viewing the puffins from just behind the Storhofdi Lighthouse (one of the oldest lighthouses in Iceland). This involved navigating a rather steep hill towards a cliff and getting out of the way of a few sheep. Once near the cliff’s edge, however, it was simply magical to enjoy some crowd-free time, watching these very special creatures. The puffins on Heimay are quite shy, but if you stay very still, and don’t get too close, you can get some nice shots of them with a zoom lens. This was the one time on our trip that my 20x zoom came in handy, as I never would have been able to get a good photo of these timid creatures otherwise. 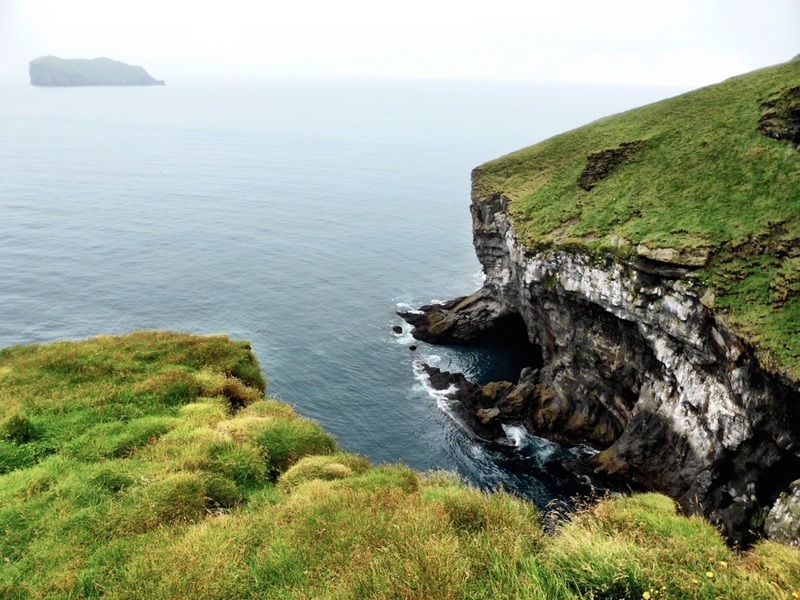 There are other ways to see puffins on this island and that includes taking a boat tour (from the same harbour as the ferry comes in to), and also visiting the Saehimar Aquarium (You may even get to hold Tóti the rescue puffin !). 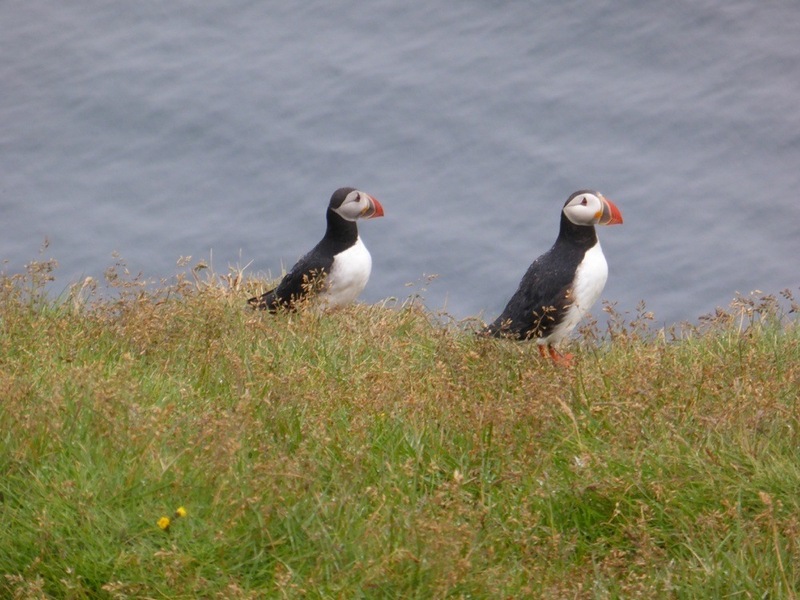 Please note that the breeding season for puffins in Iceland runs from April to September. One of the most special times to visit is in August and September when the baby puffins hatch. No longer being fed by their parents, they leave their nests and sometimes fly towards the lights of town. On these evenings, children are often seen roaming the streets at night, collecting baby birds to return to a better location the following day. This is actually quite a big event in town as you can see in the following National Geographic video. 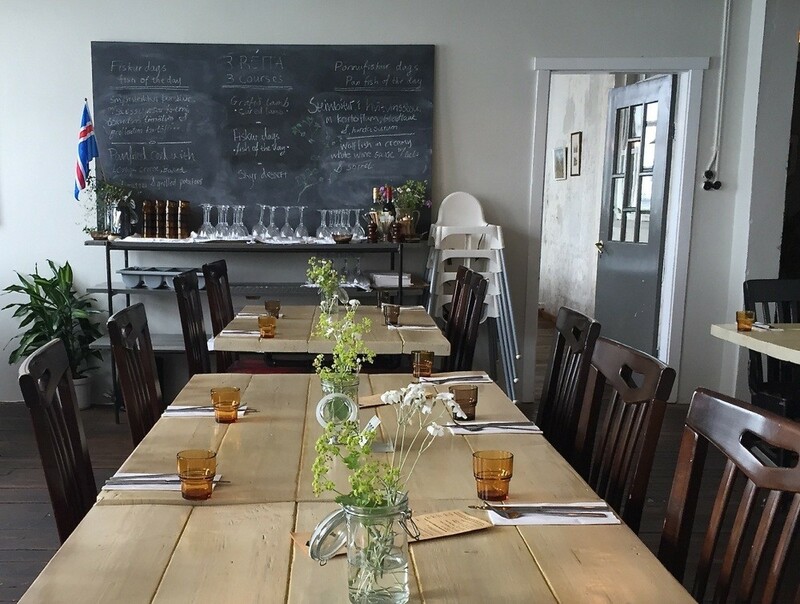 While on the island, try to squeeze in a meal at the highly acclaimed Slippurinn restaurant — a family run establishment, serving traditional Icelandic dishes. Read reviews for Slippurinn here. Ferries run several times daily to Heimay from Landeyjahöfn, offeing up some gorgeous scenery throughout the sailing. You can also fly into Heimay from Reyjavik on Eagle Air. Naturally, not everyone wants to arrange their own Iceland itinerary, so if you are looking for tours (both guided and self-directed) see these great summer packages in Iceland and winter packages in Iceland. Learn more about the Atlantic Puffin in this National Geographic article. Learn more about the 1973 eruption of the Eldfell volcano in this Wikipedia article. Take a peek at our 1 minute video on Puffins in the Westman Islands.